Before Alex Bowman searches for the winning combination at the Coca-Cola 600 on May 27 at Charlotte Motor Speedway, Bowman and his No. 88 Nationwide pit crew participated in a unique search on Thursday at U.S. Coast Guard Station Wrightsville Beach. 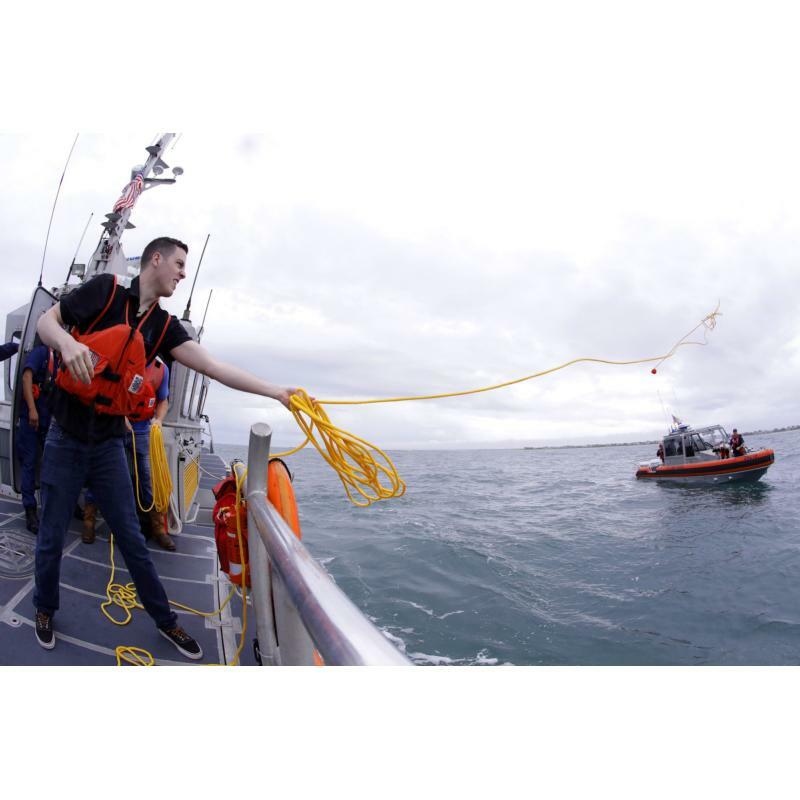 Coast Guard men and women hosted Bowman and the Nationwide crew for a search-and-rescue training scenario, answering a distress call and pulling a training dummy into the response boat during a person overboard exercise. 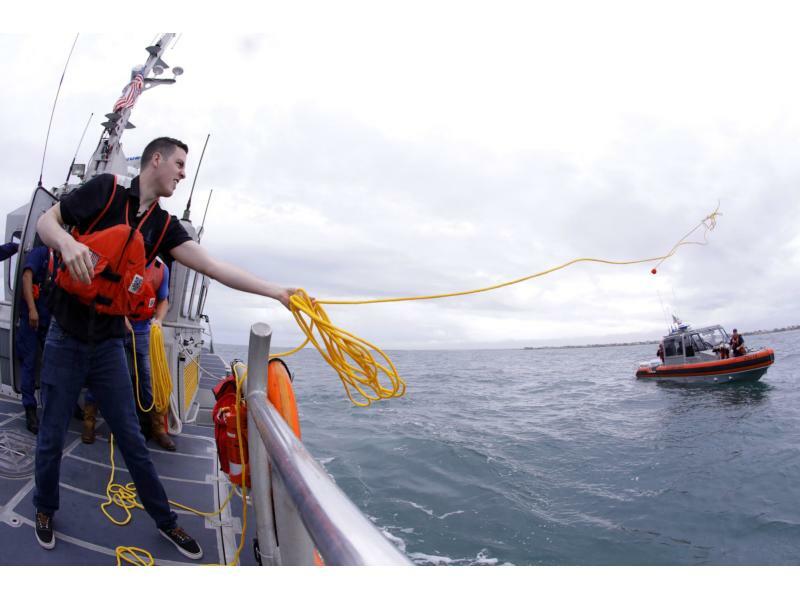 In stormy conditions similar to what many Coast Guard men and women face, Bowman and his crew learned how to toss a heaving line and tow a stranded boat back to safety. Bowman piloted the 45-foot RBM (Response Boat Medium) at a clip of 40 knots in two- to four-foot waves on the Atlantic Ocean. The visit was part of Mission 600 - Charlotte Motor Speedway's primer for the patriotic Salute to the Troops before the nation's most patriotic Memorial Day weekend celebration at the Coca-Cola 600. "It gives you a really big appreciation for what these guys do and everything they do to protect our country and to help people who need their help," Bowman said of the visit. "It's really interesting to see everything that goes into it. The boats are super cool with all the technology on them. Everything that these men and women do for us is really special. … It was definitely different, much different driving with a joy stick than with a steering wheel and pedals. It was really cool. It was the most expensive thing I've ever driven and somehow we still managed to break it. It was a cool experience." As part of the visit, Bowman joined his pit crew and Coast Guard men and women in unveiling the colorful, red, white and blue patriotic paint scheme which will adorn Bowman's No. 88 Nationwide Chevrolet in the Coca-Cola 600 on May 27. The car's windshield will feature the name of Captain Nick Rozanski, a native of Dublin, Ohio, who was a member of the Ohio Army National Guard's 37th Infantry Brigade Combat Team. Rozanski died on April 4, 2012, due to combat injuries sustained in Afghanistan. Jennifer Rozanski, Captain Rozanski's widow, worked at Nationwide in the Staff Sales Organization during the time of Nick's passing. Nationwide and the No. 88 team will host Rozanski's family at the Coca-Cola 600. The windshield naming is part of NASCAR's "600 Miles of Remembrance," which features all drivers in the Coca-Cola 600 honoring United States Armed Forces members who lost their life while serving their country. "The paint scheme is really special," Bowman said. "Everything we do for veterans is really special around the 600 and everything Nationwide does. It's a really cool thing to be a part of." The Coast Guard event was the fifth Mission 600 visit, following Brad Keselowski to Naval Station Norfolk on April 19; Austin Dillon and the No. 3 Coca-Cola pit crew to Fort Bragg on April 26; Kurt Busch to Marine Corps Base Camp Lejeune on May 8 and Bubba Wallace to Seymour Johnson Air Force Base on May 9. "It's been a great pleasure and an honor to have Charlotte Motor Speedway coordinate such a memorable event with our crew at Station Wrightsville Beach, Alex Bowman and his pit crew from the Nationwide No. 88," said Chief Jeremy Thomas, U.S. Coast Guard, Sector North Carolina Public Affairs Officer. "We appreciate the support for all men and women of the Armed Services. It was great to show their crew how our crew works. We work like a family and so do they." Through the speedway's "Patriot Partners" program, race fans or corporate customers can buy a Coca-Cola 600 race ticket to send a member of the U.S. Armed Forces to America's Home for Racing for just $25.